DESCRIPTION A unique property located not far from Storrington High Street in a tucked away position. 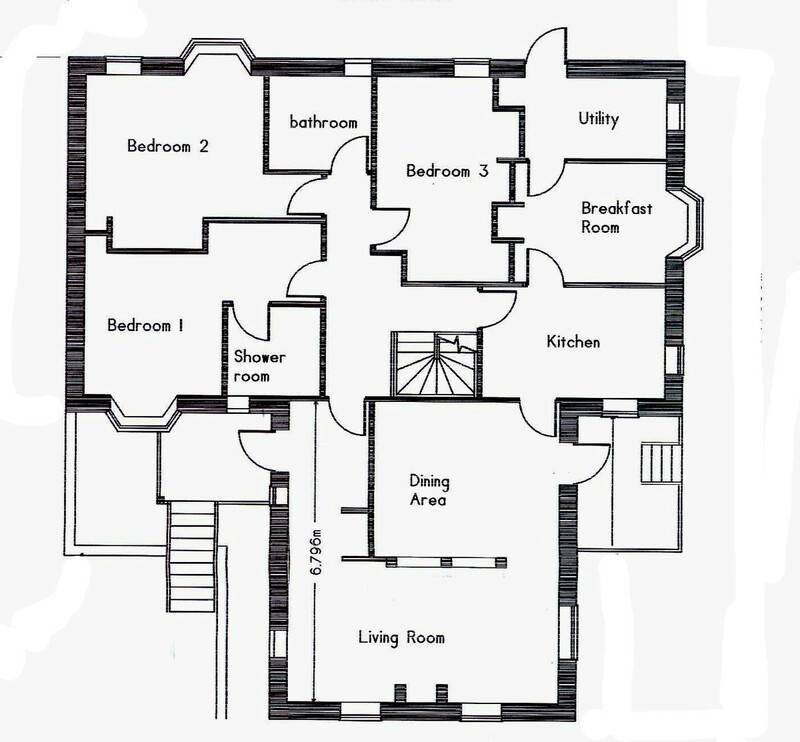 Accommodation comprises: sitting room, dining area, DUAL ASPECT kitchen with utility area and breakfast room, master bedroom with en-suite shower room, bedroom and a family bathroom and a further bedroom. 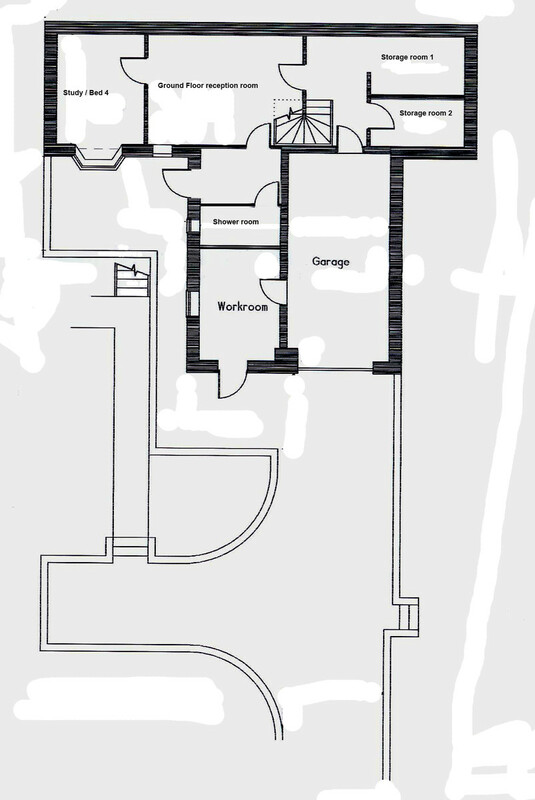 Stairs then lead down to an internal hallway with two storage rooms and a ground floor reception room. A further internal hallway leads to study/bedroom four and a shower room. Outside there is a GARAGE and WORKSHOP with driveway providing parking. The gardens have a range of beds with flowers and shrubs, a brick built outbuilding with power and light with covered storage area. The property benefits from UNDERFLOOR HEATING throughout, heat recovery and ventilation system and is TRIPLE GLAZED throughout. The property also benefits from a balcony affording VIEWS across the South Downs and over Storrington. UTILITY AREA Wall-mounted boiler, range of base and wall units, one and a half bowl sink unit, door access to garden. STAIRCASE Accessing ground floor with storage cupboard and counter above, loft access with ladder, feature glass door back to foyer. EN-SUITE SHOWER ROOM Vinyl flooring, brick feature wall, fully tiled walls, shower tray with curtain rail, electric towel rail, wall hanging concealed cistern push flow w.c., bidet, inset wash hand basin set into vanity unit with mirrored cabinet above. BEDROOM TWO 12' 10" x 12' 2" (3.91m x 3.71m) Laminate flooring, built-in wardrobe cupboards and shelving, bay window. BATHROOM Vinyl flooring, fully tiled walls, bidet, wall hanging concealed cistern push flow w.c. bath with mixer tap and shower attachment and shower curtain, vanity basin unit with cabinet above, electric towel rail. NB: Cistern not working (parts need to be ordered specially - if any buyer is going to update bathrooms, this could be left by arrangement). BEDROOM THREE 15' 2" x 9' 5" (4.62m x 2.87m) Laminate flooring, built-in wardrobe and shelving. INTERNAL HALLWAY Wall hatch to loft space. STORAGE ROOM ONE 9' 10" x 5' 10" (3m x 1.78m) Laminate flooring. WALK-IN STORAGE ROOM TWO 9' 10" x 5' 3" (3m x 1.6m) Laminate flooring, built-in storage cupboard. STUDY/BEDROOM FOUR 11' 6" x 10' 0" (3.51m x 3.05m) Accessed via ground floor reception room, laminate flooring, bay window, triple fitted wardrobes. SHOWER ROOM Accessed via ground floor reception room, vinyl flooring, shower tray with curtain rail, wall hanging concealed cistern push flow w.c., space and plumbing for washing machine, basin with cupboard beneath. WORKSHOP Range of cupboards and storage, door to front. BALCONY Leading from the lounge, affording wonderful views towards the South Downs and over Storrington. PARKING Gravel drive with parking for several vehicles. GARDENS Large raised beds with wide range of flowers and shrubs, wide stone steps leading to wooden stairs to front door, outside lighting, ornamental pond (not currently functional), covered log store, brick built outbuilding with power and light with covered storage area.